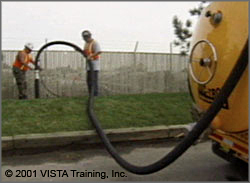 Vacuum equipment helps you verify utility depth. Before you can safely cross or work close to an underground utility, you must first verify its depth. Flags and locator marks tell you the direction the utility is running, but not how deeply it is buried. The only way to be sure of utility depth is to carefully expose it yourself. Vacuum equipment saves hand labor. Vacuum technology can expose buried utilities without harming them. It uses suction and water pressure to remove soil down to the utility. Operate vacuum equipment only if you have been properly trained in its use. If damage to a utility does occur, report it immediately. Repairs can be made more easily while the utility is still exposed. Never try to fix a damaged utility yourself. Be sure to wear proper personal protective equipment when using vacuum technology to verify utility depth.